Eye On Sports Media: You Think You had a Heavy Load at Work Today? You Think You had a Heavy Load at Work Today? 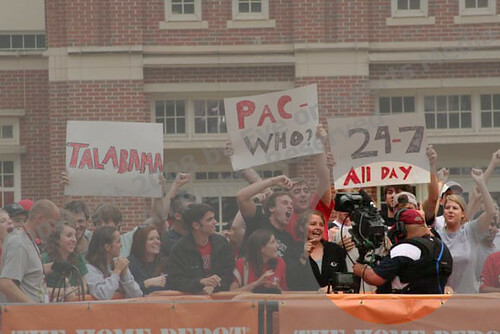 Athens, GA (Sept 26, 2008) - ESPN College GameDay Senior Coordinating Producer Michael Fountain relies on a team of around 80 people each week for the show. And they work very hard for him and the talent. "These people work their tails off and get no credit, and they really deserve it," he said. 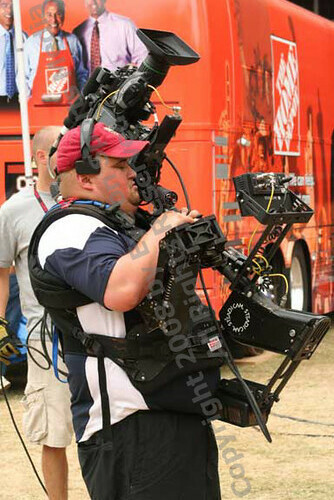 So the next time you are sitting at a desk thinking you are carrying a heavy load at work that day, be thankful you are not someone like the ESPN College GameDay steadi-cam operator. This gentlemen literally carries a load to do his work...a 70 pound load. Photograph Copyright 2008 by Eye on Sports Media/The Cayuga Group, LLC.